A Wider Bridge gives you, for the first time since we started our annual Israel Missions, a video sneak peek at the experience of the participants on the trip during our 4th Mission in October. Watch it here! For 10 days at the end of October, a group of 23 LGBTQ people from North America joined A Wider Bridge to explore Israel. 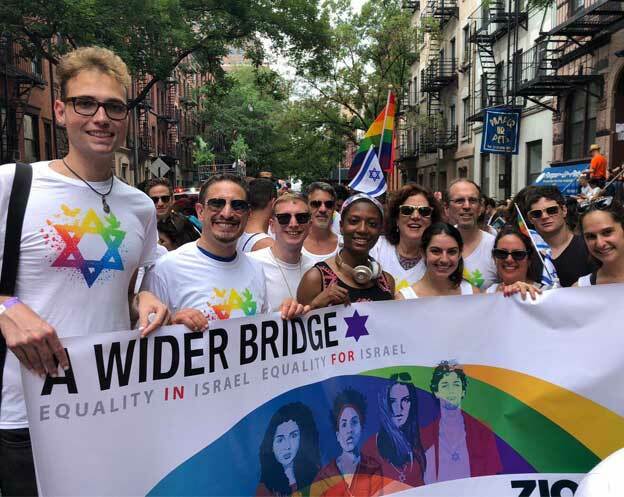 This unique trip brought together an incredible and diverse group of leaders – lesbian, gay, bisexual, trans and queer (LGBTQ) plus allies, Jews and non-Jews, younger and older. Famous gay Israeli social-media master Idan Matalon joined the Wider Bridge group in Tel Aviv and Jerusalem to create a fun video with the participants of this year’s Israel Mission, in order to give a taste of what the journey was like for them. Through shared experience, participants engaged with modern Israeli and LGBTQ life, meeting with leaders, artists and change-makers across the country, learning about both the recent and ancient history of the people, the land and the state of Israel. During the making of the video, Idan posted teasers on his Facebook page to his many fans around the world, teasers that described how much fun they’ve had, and the connections they’ve established during the process of making the video. “It’s a challenging and rewarding country; we need to continue our support and advocacy for it.” – Chris McCannell, D.C.